Villa: Who was he, anyway? Arroyo: A crazy old man looking for death. But he was brave. Hollywood's neighbors south of the border have frequently received short shrift on screen; you'd think that the proximity between the capital of the American film business and Mexico would lead to a better cross-cultural understanding, but Latinos may be behind only African Americans and Native Americans when it comes to being underrepresented or misrepresented in the movies. 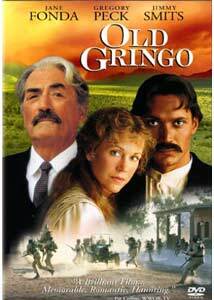 Unfortunately, though Old Gringo is more respectful of Mexicans and their history, it's just not a very good film, and the presence of some distinguished actors can't keep this from being a muddle. At first glance, you might be hoping for a fine mix of acting styles, given that the three leads are from fairly distinct generations—there's Gregory Peck, solidly Old Hollywood; Jane Fonda, who came of age professionally with New Hollywood in the late 1960s and early 1970s; and Jimmy Smits, who has done creditable work on television series. (This movie was made during the run of L.A. Law.) But they're sorely let down by their material, and so you don't get the best of Atticus Finch and Barbarella and Bobby Simone, but only some master indicating and generalizations. It is 1913, and our heroine is Harriet Winslow (Fonda), who lives in Washington with her mother, where they live off of a veteran's pension—the story is that Dad died in the Cuban-American War, but Harriet and everyone else knows that the old man just decided not to come back to his shrew of a wife. Harriet finally has had enough of her suffocating mother, and puts in for a job working as a governess for one of the elite families of Mexico, the Mirandas. The problems are many, beginning with the stilted dialogue. There's only so much even a fine actor can do with Hallmark-like sentiments masquerading as conversation—some of the clunkers include "I was always afraid of the unknown," "I've spent my life taking care of an empty grave," and "This is the first sensible thing I have done in my life." Another major problem is that though Bierce is a writer of some reputation, to a contemporary audience he doesn't have the familiarity of, say, Hemingway, so there's no joy or pleasure in discovering how the great man has decided to spend his last days. He tells his best known story, An Occurrence at Owl Creek Bridge, to Mexican children at a campfire, but so what? It doesn't have much to do with the movie, and is like having F. Scott Fitzgerald tell The Great Gatsby as a bedtime story. And Peck isn't given much more to do than to die—there's nothing tremendous he wants to accomplish in his last days, other than see la revolución. Beyond that, some storytelling basics are simply lacking—about an hour into the movie, Smits tells a gleeful crowd that "We found them! We found the papers!" An explanation comes after the fact, but it's way too late in the movie to start filling in your audience on just what is going on, and what these people are after. The politics are muddled, and so pretty much what's left in terms of narrative has to do with Harriet, with which of the two gentlemen will get to deflower la gringuita. There are some nice visuals, though, especially of the proletariat walking through the grand home of the lords of the land, the home that the workers slaved to build, the pleasures they had been denied. It's a shame and a missed opportunity that these aren't in the service of a better story. Image Transfer Review: Lots of pink and orange filters make for a gauzy-looking film, and though the blurriness is pretty clearly an aesthetic choice, it doesn't make for a great DVD transfer. Colors are saturated and black levels are steady, but there's an almost woozy quality to the images, and that's not a good thing. The disc is a flipper, with a cropped, pan & scan version on one side; the anamorphic transfer on the other is the recommended choice. Audio Transfer Review: The Dolby mix is a pretty rich one. Hiss is relatively absent, though the ambient noise level can be too high, and dynamics are a little off, especially for Fonda's voice-overs. Good use is made of the capacities of the 4.0 track. Extras Review: Trailers for a couple of Anthony Hopkins movies, along with subtitles, are the only extras. A few handsome images and some overdue respect for the history of Mexico can't make up for the deeply problematic story here. There are some pretty pictures, but you can safely take a pass on this one.